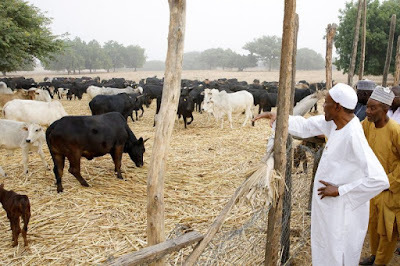 An aide to the Akwa Ibom governor has accused Nigeria’s President Muhammadu Buhari of abandoning the people to economic hardship and fuel crisis, while according more care to his cows. Filling stations across Akwa Ibom, for instance, now sell fuel at N170 against the government approved price of N145. Apparently mocking the president, Mr. Ndueso said, “If the cost of grass were to increase, or if anyone were to temper with the comfort of these cows, I am sure Baba would come back and take urgent actions. “Today fuel is N180 and those who earn their wages monthly from worshipping Baba on Facebook are also suffering the same fate,” he said. The governor’s aide, who also criticised the human rights community in the state for not speaking up against the increase in fuel price, dared a well-known Buhari supporter in the state, Imaobong Akpan, to lead a campaign against the increase. But Ms. Akpan reacted by asking Governor Emmanuel to call his aide to order. “This is a president that has been the most magnanimous to the welfare of Nigerians, and specifically the governors through the regular and timely release of budget support funds, Paris club refunds, and other social intervention funds meant to alleviate the sufferings of Nigerians, of which Gov Udom Emmanuel, Mr. Essien’s boss is a major beneficiary,” she told Premium Times, Thursday. “It is on record that Mr. President has been very kind to the people of Akwa Ibom State through the various appointments and other strategic partnerships meant to grow the economy of Akwa Ibom. “The fuel crisis in the country is traceable to deliberate sabotage which I believe the government is addressing and therefore should not be politicised,” she said.